When you’re attending a Songkran celebration, it’s a given that you will end up drenched in water. For the UChat Songkran Day-Out festivalgoers at Setia City, Shah Alam, last weekend, whether they had a water gun in hand or not, they were soaked to the bone – all thanks to the downpour in the evening of both days of the festival. The rain did not stop the fun, however. We didn’t get to join the festivities on the first day but we were informed that the rain stopped just in time for the concert in the evening. The rain on the second day wasn’t so forgiving, though, as we witnessed first-hand. Last Sunday, after the water activities and games of the day wrapped up, it was time to welcome the final four singers of the festival onto the stage. Despite the rain, the festivalgoers were not deterred, armed with umbrellas and donning raincoats of various colours, they trudged onto the grass field and patiently waited for 7.30pm to roll around. Finally the concert kicked off about 10 minutes after the scheduled time. We positioned ourselves among the energetic, screaming fans, basking in the festive atmosphere even as raindrops pelted us. Sarawakian singer Priscilla Abby kicking off the concert with her songs. YouTuber turned professional singer Priscilla Abby opened the show with three songs including “Burn” and “I Love the Sky”, before singer-actress Elizabeth Tan a.k.a. Lizzy took the stage with three songs as well. Lizzy sang two of her own songs, “Police Entry” and “Semua Sudah”, before wrapping up her performance with a medley of Bruno Mars’ songs. The misty rain lent an ethereal touch to Elizabeth Tan’s performance. Ploychompoo was shining brighter than her namesake, pink sapphire. Up next was German-Thai singer Jannine “Ploychompoo” Weigel. The singer cheerfully greeted her Malaysian fans in English. In between her songs, she would take the time to talk to everyone and thank them for being there despite the rain. The singer performed five songs in total: “Diamonds”, “Heart Stop”, “Words”, “Pak Rai Jai Rak” and a cover of Ariana Grande’s “7 Rings”. Last to perform was K-pop idol Chung Ha. The crowd noticeably grew bigger and more compact right before the singer was set to perform, so there was no question who most of the festivalgoers were there to catch that evening. Chung Ha was performing for the first time in Malaysia yesterday. The South Korean singer kicked off her performance with her latest single, “Gotta Go”, and the crowd could be heard singing along during the chorus. 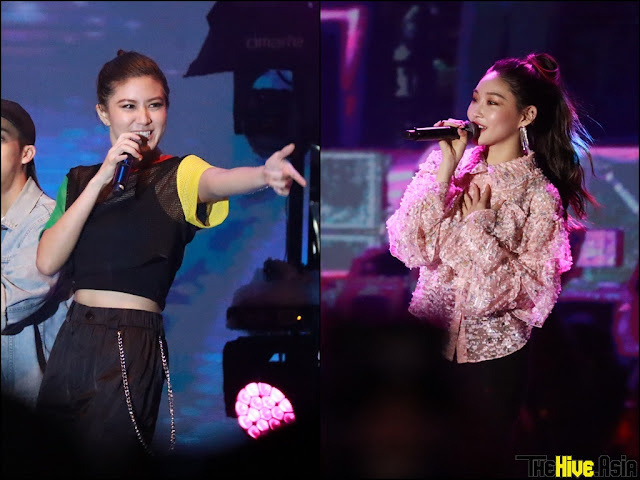 This being her first time visiting Malaysia, the singer was pleasantly surprised and amazed to hear just how well her local fans could sing along to the Korean lyrics. She happily asked them to continue singing with her. Chung Ha threw out quite a few heart poses for her fans. After melting fans’ hearts further with her aegyo while performing “Pit A Pat” and then setting them on fire with her sultry moves in “Roller Coaster” and “Why Don’t You Know”, the singer wrapped up her stage with a cover of Jessie J, Ariana Grande and Nicki Minaj’s “Bang Bang”. With that, the 2-day UChat Songkran Day-Out ended with a bang!